Admiral Horatio Nelson sailed from Antigua to defeat the French at Trafalgar in 1805. In fact he was in charge of the navy dockyard here for a while and the very same dockyard, at English Harbour, still exists and is now preserved as a yacht harbour. We sailed in on 9th March after a great day's sail from Guadeloupe. Looking southeast across Freeman Bay in English Harbour, with Shirley Heights behind and Fort Berkeley bottom right. Looking northwest from Shirley Heights across English Harbour, with Falmouth Harbour at top right. We dropped anchor, hoping that we wouldn't hook one of the 200-year-old hurricane chains that still litter the seabed here. After clearing customs and immigration we had a quick look around the old buildings and docks. Antigua is home to superyachts and fancy regattas so the prices here reflect the wealth of these visitors. But ordinary cruisers come here too and enjoy the lively social scene (boozin'!). In fact, on our first night, we met up with Foss and Erik again (last seen in Guadeloupe) and had a farewell party. Next morning as they left, Foss played "Auld Lang Syne" on her concertina and Tom replied with "Will ye no come back again" on the pipes - bring a tear to a glass eye! Over the next few days we met old and new friends from other cruising boats. In a place like English Harbour, we realise that we're not alone in wanting to travel the world on our own sailing boat. We had a great time for a week mixing with cruisers from Austria, Sweden, Denmark, England and the USA, swopping stories and having a laugh and a beer or two. They were a great crowd. In fact, one of the downsides of cruising is that you make friends, then have to say goodbye, knowing that you may never meet again and you feel a loss even after just a few days of knowing each other. Copper and Lumber Store (now a hotel and restaurant), Nelson's Dockyard. Nelson's Dockyard was a fascinating collection of Georgian buildings and dockyard hardware - slips, giant capstans, etc. The Admiral's Inn was formerly the Pitch and Tar Store and the Engineer's Office. The pillars beside it mark the remains of a sail loft. While wandering through the dockyard museum, which is located in the Admiral's House, we came across a case containing an example of our outboard motor - a British Seagull Featherweight 40. Our outboard motor - in the museum! Every Sunday night, on Shirley Heights, the hill overlooking the bay, there is a wild barbeque with steel and reggae bands - very lively entertainment and a fantastic backdrop (the first picture on this page was taken from up there). The steel band Halcyon at the Shirley Heights BBQ. We actually stayed in Antigua nearly a week longer than originally intended as Sue found an Australian-trained chiropracter and had three back-crunching sessions (at Akparo, English Harbour). This was to sort out a stiff and sore lower back that she's had since we emptied the house last May. Worked a treat and Sue now reckons she has a chance to do Hula dancing when we reach Polynesia. 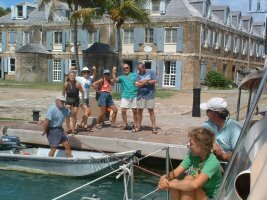 Antigua is a bonny island and the links to Nelson's navy are fascinating, but our best memories are of the people we met on other sailing boats - an inspiration to continue into the Pacific and beyond. Next, however, in a complete change of plans, we headed for Venezuela.